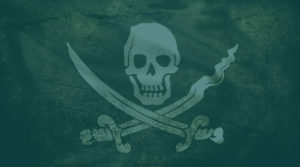 I love pirates. Like, really really love pirates. The ships, jolly rogers, and quotes scattered throughout my apartment (and office…sorry Denise) can attest to this. There are many reasons I have this affinity for all things dark and seaworthy but among them is a deep connection with the characters written into these stories. I find something fascinating in deeply flawed characters with mixed motives who you end up whole-heartedly rooting for in hopeful anticipation through a story’s ups and downs. It pushes against a common narrative we like to read into the world; that ultimately there are only two categories of people: good and bad. These stories create space for the misunderstood, those you’re not sure you can trust, the characters straddling the line who are torn between desires, and invite us to consider our own hearts. Where would we stand if the line was drawn? Good person? Bad person? Just a pirate trying to make living? Most people strive to be good people and try to avoid the bad people. But aren’t we all just deeply flawed characters with mixed motives? Even our Old Testament Sunday School heroes like Abraham, David, and Moses. We tend to put them in the “good guy” category and reserve “bad guy” for people like Pharaoh, King Nebuchadnezzar, and the Ninevites. I’m not sure it’s that simple. The Bible rips apart our good people and bad people categories and puts things in the proper order. We have all utterly fallen short of his glory.1 And yet still we create our own credentials for righteousness whereas our God’s love shows no partiality.2 We are lost sheep, running away from the good shepherd to pursue our own little kingdoms. All of us. Yes, all. Noah, Paul, Peter, James, the rich young ruler, the prostitute, Mary, you, me, your neighbor, your parents, your co-workers, your ex, your best friends, your ex-best friend, your comGroup, your comGroup’s new friend…all on the wrong side of any lines we might draw, all in the same boat, all in desperate need of forgiveness and grace. And then comes the biggest hope in all history – “but God.” But God saw our lines of segregation, saw our awful attempts at attaining righteousness, and stepped into the scene, eradicating our lines and achievement awards. He came to seek and save the lost (all of us) to intervene in our stories, to bring us home, to restore us, to cover us in his righteousness so that we could be redeemed. Too often, though, we get comfortable in our religion and forget that apart from Christ we are helpless and lost. We start only seeing darkness when it’s in other people, the bad people, and only see light in ourselves, the good people. We forget that we are still fighting sin every day and it is only by God’s grace that we can find victory. It’s only by grace we can daily put our sin to death, killing the struggles of our flesh. It’s by grace we run the race. Jesus is the founder and finisher of our faith. There is no “us vs. them,” no “good people” and “bad people;” even writing that brings tears to my eyes. Us? Them? No! No. “One has died for all, therefore all have died; and he died for all.”5 All have sinned. All struggle. All are broken. All desperately need to be reconciled and brought into the light. Sinners all. But the good news is that in God’s mercy and grace, he saves sinners. God saves sinners…! What right do we have to look down upon others? Or treat people as second-class citizens? Or self-righteously condemn someone who is different from us? That person who doesn’t dress like us, who doesn’t watch the “right” TV shows, who doesn’t like the “right” gender, who doesn’t have the “right” political views – is it possible that we’re not so different after all? Is it possible that underneath all of our differences we all share in the same deep struggles? Is it possible that we need the same grace, the same blood to be poured out to cover all our sins? God’s grace is infinite and his love abounds. May that be fuel to love and welcome the poor, naked, guilty, shamed neighbor into our lives, into our comGroups, into our hearts. They are deeply flawed image bearers of God with mixed motives who desperately need Jesus…just like us. Where would any of us be without Jesus and the price HE paid to set us free?! Thank you.